For more than 2000 years, lighthouses have been known for guiding ships into safe harbors, through channels, and around treacherous waters. These structures are respected as guiding lights in the darkness and sources of inspiration which somewhat attributes to their mystique attractiveness and romantic appeal. As a result, these sentinels have become symbols of positive direction in our lives and hope for a bright and peaceful future. The Lighthouse Chronicle provides a chronological overview of the history of lighthouses beginning with the first lighthouse known as the Pharos of Alexandria constructed along the Nile River in the 2nd Century B.C. and traces their use as they spread to England in the 1st Century A.D., to North America in the early 1700's and to the most recent lighthouse built in Charleston, South Carolina in 1962. 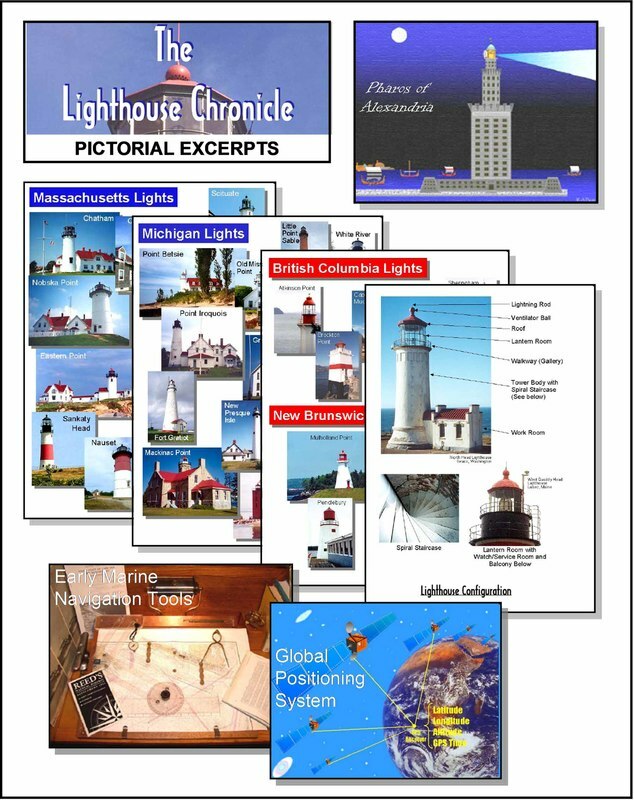 The book also provides a listing of all lighthouses in the United States, lighthouse photographs, a section on how lighthouses are designed and constructed and a section on how they are being replaced by Global Positioning System (GPS) marine navigation technology. The Lighthouse Chronicle was authored by Rudy Bess in 2006. Rudy and his wife Beverly are natives of the town of Metropolis located in Southern Illinois on the Ohio River. They currently reside in Hazelwood, Missouri just north of St. Louis and the confluence of the Missouri and Mississippi rivers. Rudy was employed by McDonnell Douglas Corporation/The Boeing Company for more than 36 years and is now retired. Rudy and Beverly enjoy photography, researching lighthouse history and lore and exploring the seacoast, the Great Lakes and inter-coastal waterways. Over the past two decades, the couple has visited over 450 lights in the U.S. and Canada. In 1998, they had a goal to visit 100 lights in one year and achieved the goal by year’s end. Rudy has international recognition for his lighthouse photography as a result of publishing over 200 photographs in three Lighthouse Society of Great Britain (LSGB) CD projects. Rudy has received acknowledgement for his research and interest in lighthouses in the book titled "North Atlantic Lighthouses" authored by Jean Guichard, the famous French lighthouse Photographer, and Ken Trethewey, founder and chairman of the LSGB. Rudy and Beverly are Founders of The Hope Light Foundation that is dedicated to communicating cancer awareness information and saving lives.